The Boodles Tennis tournament is recognised as one of the most coveted tennis competitions, giving avid fans the chance to see some of their treasured sporting heroes take centre stage. 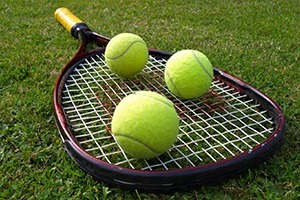 The early years of this dazzling contest saw visitors witness four days of tantalising tennis action but in 2005, due to its popular demand, a fifth day was also added . Many of the world’s elite have contested the prestigious title, with players such as Tim Henman, Greg Rusedski and former Wimbledon Champion Maria Sharapova all featuring. Stoke Park, home of The Boodles, is commonly known for its beauty, style and sophistication. It’s pristine green lawns and alluring hotel facilities make this iconic setting the perfect environment for guests to sit back, relax and enjoy some top-drawer tennis. Dazzle your esteemed clients with our delightful Boodles Tennis tickets & hospitality packages. The sublime Players Enclosure is a fine to enjoy the terrific Boodles Tennis tournament. The relaxed and intimate environment provides an idyllic setting for those who wish to experience the very best in corporate hospitality. Guests will be cordially greeted with the very finest Perrier-Jouët Champagne before indulging in a delectable three course gourmet lunch. Those who still wish to satisfy their refined palates can enjoy a delightful afternoon tea service before taking to their reserved court side box to savour of the world’s finest tennis. Private Boxes are also available, catering for 12 guests. If you are looking to enjoy the Boodles Tennis tournament in sublime style, then look no further than the sumptuous Legends Enclosure. Not only will distinguished guests be treated to a delicious three course meal in the blissful Palladian Mansion, but can also look forward to having the best courtside seats in the house. Arrival sets the tone for the tone with an inviting Pimms reception as guests soak up the splendid views of the impeccable park grounds. An afternoon tea will also be available to round off a superb day at this tremendous tournament. The Venue Stoke Park, Buckinghamshire, is located approximately 5 miles from junction 2 of the M40. Fast trains run between Paddington and Slough (this takes about 16 minutes) There is a courtesy bus for our guests. If you prefer to travel independently you can take a taxi. There is a taxi rank and this will cost you approximately £5 each way. Thank you Eventmasters for a fantastic day of hospitality and tennis! What a day! Fantastic Tennis combined with fantastic hospitality… I will be booking again! We have a dedicated page where you can view, download and print all of our event information for the Boodles Tennis tournament at Stoke Park.